My friend Rob once said guys like to smoke pipes simply for the pleasure of lighting and maintaining a small fire in their hand. I didn’t need Grace asking me if she could “light all the candles [referring a box of wooden matches]” to know that people seem to have an innate attraction to fire. When I was younger, a small campfire in our back field led to a grass fire that scorched nearly 50 acres, including a large grove of trees. Fire is not something to play with, but the attraction is there and parents need to prep their kids to handle fire responsibly. Roasting marshmallows over a campfire is an easy place to start. It’s a fun activity, and the kids can participate at every step, from gathering firewood to lighting the fire to feeding the fire and, finally, to putting it out. And you don’t need to go camping to have a campfire. With three large maple trees in the backyard, we have an endless supply of firewood and a regularly stocked bonfire pit. It is here, close to home, that the best lessons are taught. Everyone who knows a little woodcraft understands that big fires start from little ones. 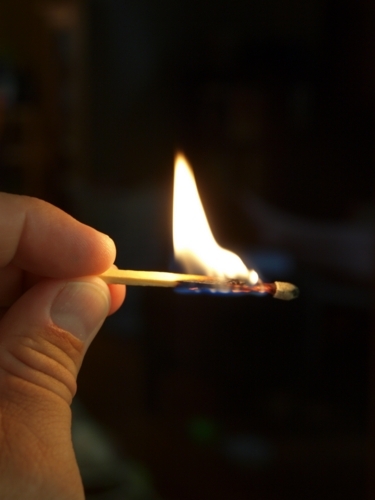 So knowing how to start and maintain a small fire is important. As a boy I was taught the log cabin and tipi methods. Both involve building a loose framework of sticks around easily ignited tinder. Once the blaze is going, you add heavier logs. This is when you teach kids about the dangers of burning, but also how fire needs oxygen to burn. It’s also a good time to explain how the fire is kept contained (hopefully you have a fire ring of some kind). As the coals burn down�the best time for cooking hotdogs and roasting marshmallows is when you have a bed of white coals�you can show kids how fires don’t just easily die out. In fact, long after you think a fire is dead, it only takes a piece of newspaper and some strategic blowing to get it going again. When it’s time to call it a night, put the fire out with plenty of water, or if it’s really burned down, break up the cinders and make sure it’s smothered. The kettle works on a simple design that funnels the heat and smoke of a small fire in a metal bowl up through the middle of the kettle, thus heating not just the water on the bottom, but water throughout. More heat heating more water makes for a very fast boil. Add to this an optional grill stand, and you can be cooking on top of the vent while the water for coffee, pasta, or dishwater boils below. My kids are too young to be handling matches quite yet, but it’s never too early to start teaching them a bit about the dangers and responsible handling of fire. If you find a teachable moment, a good way to fuel the �fire talk� is to discuss the five Ws of fire: Who gets to use fire? What does fire do? Where do we use fire everyday (furnace, water heater, campfires)? Why do we need fire? How do we handle a fire? (Okay, that’s four Ws and an H, but you get the idea).